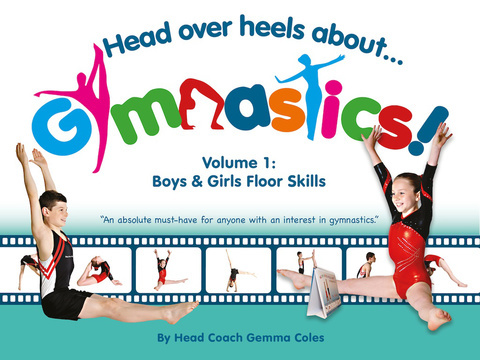 Head Over Heels About Gymnastics is the gymnastics app that provides step-by-step instructions and top tips explaining how to perform a large variety of gymnastic skills via simple language, eye catching photography and bite size video tutorials. This app is based on a book, also called “Head Over Heels about Gymnastics”, which covers a range of gymnastics skills. This app uses similar content, but enhances the experience by including videos showing how each skill should be practiced and perfected, including slow motion to show fine details of the skills. There is a free sample to try, which includes the cartwheel skill, or you can purchase the full range which covers all the skills available. The format of the app makes it very easy to use - the pages of skills are shown in a simple eBook type, with a clear page layout showing photographs, along with complementary notes and including buttons to play the video content. The graphics on the app are professional throughout, and lead users consistently through the key points of the skill. The notes contain enough detail to be very helpful, without overcrowding each page. Graphics are of a high quality throughout, enhanced by the photographs of gymnasts at various stages throughout each move. All the videos provided are very useful, going into a deal of detail on the skill and making it clear how to start out and then how to continue to refine technique. Again, the quality is very high, with the videos very well structured and presented. Sound quality is also good, meaning that it is easy to follow and understand the instructions given. 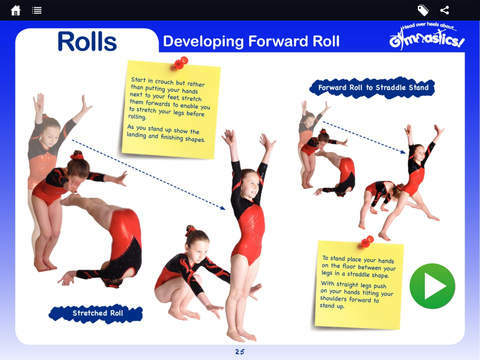 This makes the app appropriate for beginners through to more skilled gymnasts. In terms of the scope of this app, it could be useful in a range of situations, from children practising at home to school and club situations. At present, the app provides a single volume of floor skills - although there is potential for further volumes to be added in future. Overall, this app is very slickly presented and offers opportunities for those wanting to learn or teach gymnastics skills. The format makes it useful for either encountering new skills or developing and refining existing skills, as well as useful for differentiation between this variety of uses. It is worth noting in particular the potential for using the videos on an interactive whiteboard for whole class demonstration and use.